I know a lot of you will understand when I say that salty, crunchy snacks are my weakness. While I enjoy my fair share of sweets (like these Chocolate Hazelnut Energy Bites), when I’m hungry, I crave savoury munchies. And when I say hungry, I mean it’s 5:00 and I’m starving but haven’t started preparing supper yet! We are talking crackers, chips, popcorn…..whatever is readily available! So needless to say, I try to limit the chips and keep lots of clean eating snacks on hand. A few pretzels or plain almonds are usually my go-to. What are your go-to snacks to satisfy your pre-supper hunger? 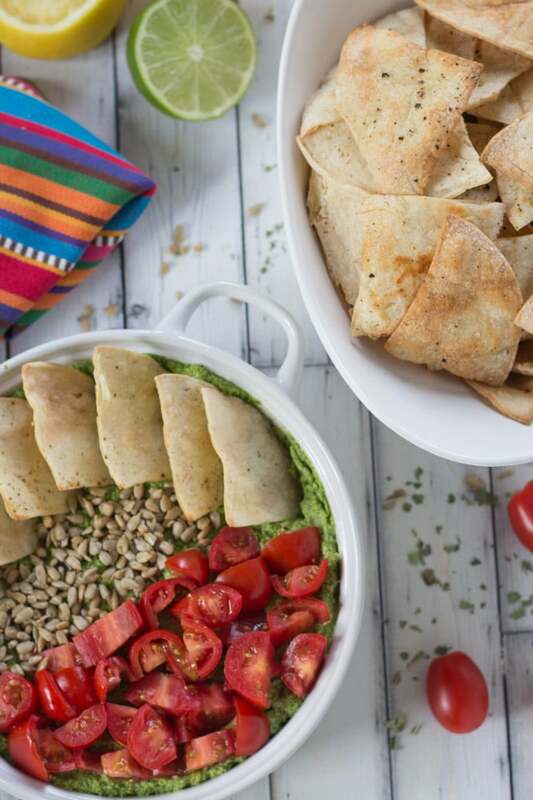 Given my cravings for savoury snacks, when I was brainstorming recipe ideas for Cinco de Mayo the following were my requirements – crunchy, salty, filling, and somewhat healthy. I practice the 80/20 rule so ‘somewhat’ healthy is perfectly acceptable! These Sea Salt Lime Tortilla Chips with Creamy Kale Pesto definitely hit the mark. This combo is loaded with flavour and clean eating ingredients! The tortilla chips definitely meet the crunch requirement and are incredibly easy to make. I’ve made about 5 batches this week just in preparation for this post 😉 . 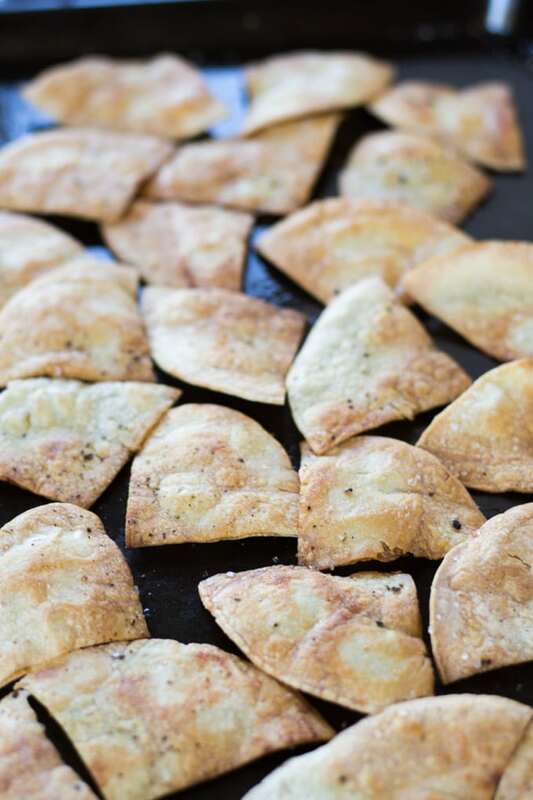 For this recipe, I used store bought corn tortillas, cut them into triangles and seasoned them with extra virgin olive oil, lime juice, sea salt and pepper. After 11-12 minutes in the oven, they were super crunchy and not as oily as store bought tortilla chips. And if spicy is more your thing, forgo the sea salt and lime and opt for a cajun or chili powder seasoning. As long as you use some olive oil to lightly coat the tortillas, you can use any seasoning you like! So that’s the chip, but what about the dip? 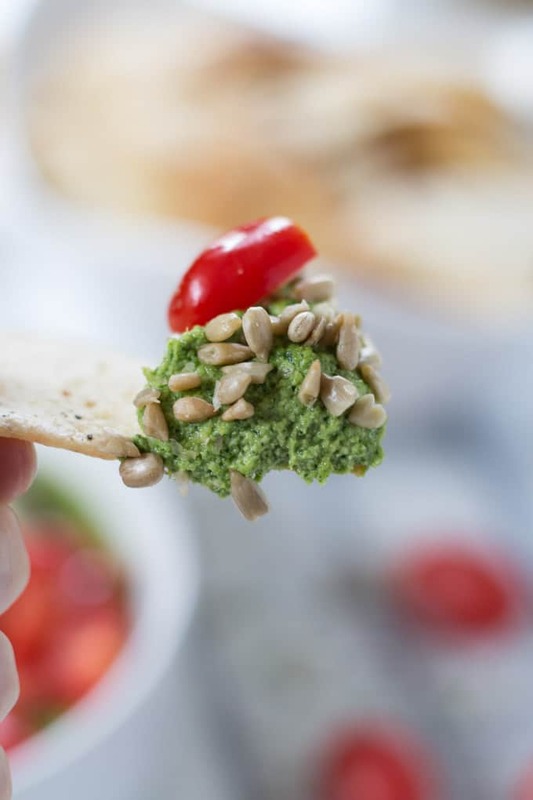 Sure, salsa or guacamole would pair nicely with these Sea Salt Lime Tortilla Chips, but a Creamy Kale Pesto can do so much more! I make different types of pesto all the time. With so many varieties of greens, nuts and seeds to choose from, the options are endless. And pesto is so versatile. You can add it to pasta dishes or salads, or you can use it as a dip or a spread. 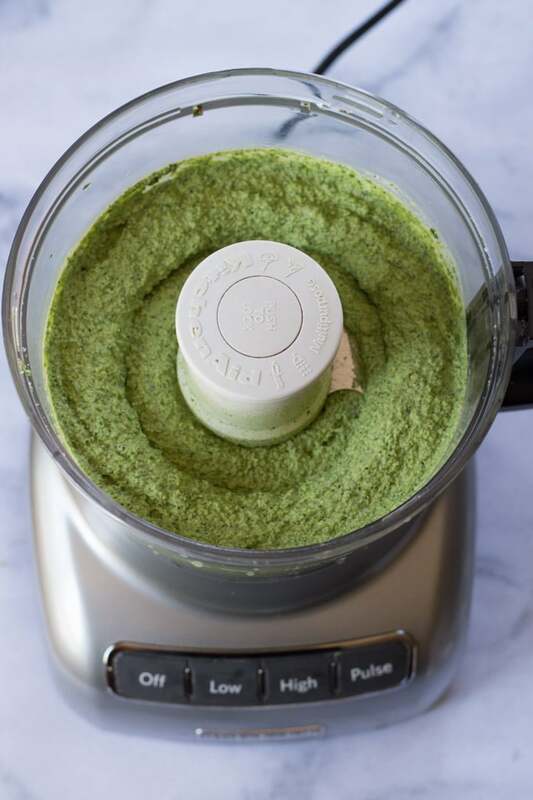 (Look for a future post where I use this Creamy Kale Pesto as a spread in a recipe!) If I’m using it as a dip or a spread, I usually keep the pesto pretty thick, which means using lots of nuts and seeds and going easy on the oil. This Creamy Kale Pesto is packed with kale (obviously! ), cashews, sunflower seeds, lemon juice, basil and garlic. The cashews and cashew milk make it super creamy, and the garlic, lemon and basil give it a nice kick. I often make this Creamy Kale Pesto the centrepiece of a snack board with bread, cheese, crackers and veggies. But my new favorite way to enjoy this pesto is with these Sea Salt Lime Tortilla Chips. The chips have a mild flavour so it doesn’t overpower the lemony and garlicky pesto goodness. But I’ll be honest, this snack will make you thirsty (as most worthy snacks do! ), so be prepared to break out that beverage to quench your thirst! After all, Cinco de Mayo does fall on a Friday this year 😉 . It only takes 20 minutes to whip up a batch of these Sea Salt Lime Tortilla Chips with Creamy Kale Pesto! 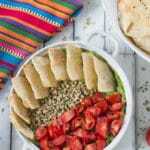 So make this recipe a part of your Cinco de Mayo celebrations or your next weekend gathering and let me know how it turns out! Sea Salt Lime Tortilla Chips with Creamy Kale Pesto makes a great quick and easy snack, appetizer or potluck dish. It is loaded with flavour and can be prepared in 20 minutes! And the best part? This recipe is full of clean eating ingredients such as kale, cashews and sunflower seeds. 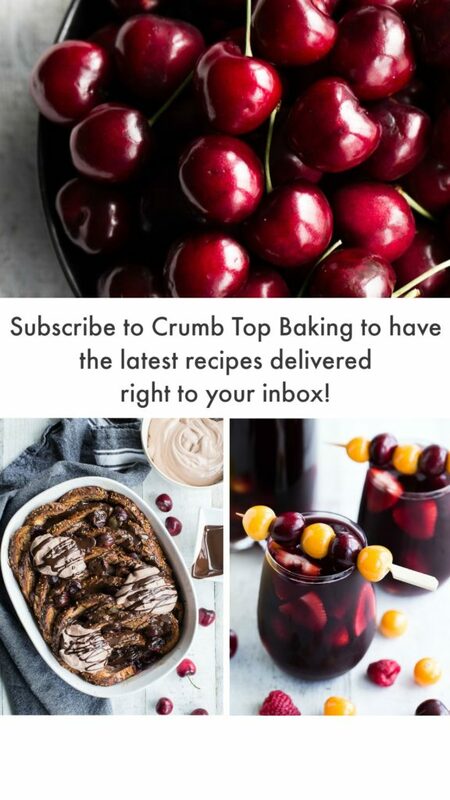 So whip up a batch and indulge in a healthy snack! In a small bowl, mix together the olive oil and lime juice. Place 6 corn tortillas on a large ungreased baking sheet and brush one side with the oil/lime juice mixture. Sprinkle with half of the sea salt and pepper. Flip the tortillas over and repeat. (If you have some oil/lime juice leftover, don’t worry about it. Just brush a little bit more on or discard it). 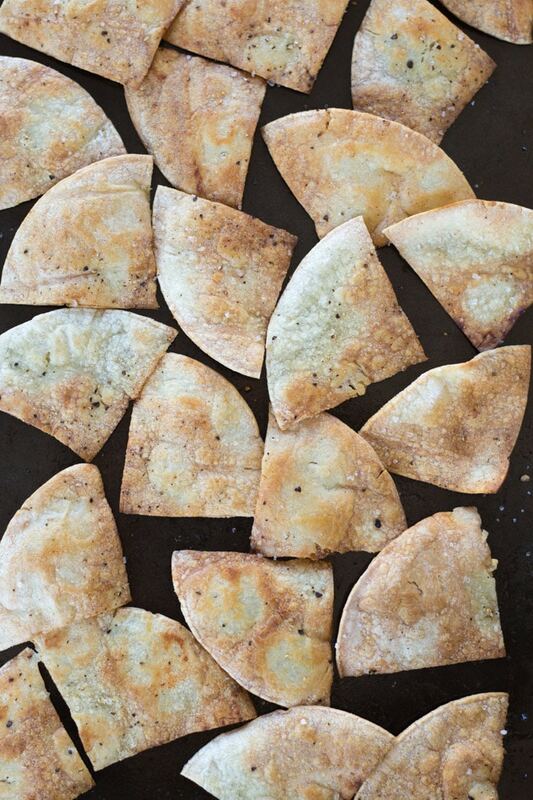 Cut each tortilla into four triangles. Bake in the preheated oven for 7-8 minutes. Remove from the oven and flip the tortilla triangles over. Return to the oven and bake for another 2-3 minutes. You want these tortillas to turn out crunchy, but keep an eye on them to make sure they don’t burn. Once you remove them from the oven they will continue to get crispy on the baking sheet. If they still have a rubbery texture, return them to the oven to bake for another minute. Serve the tortilla chips warm or store in an airtight container on the counter for 2-3 days. Place all the ingredients (except the optional toppings) in a food processor or powerful blender and blend on high for 5 minutes. Stop periodically to scrape down the sides. 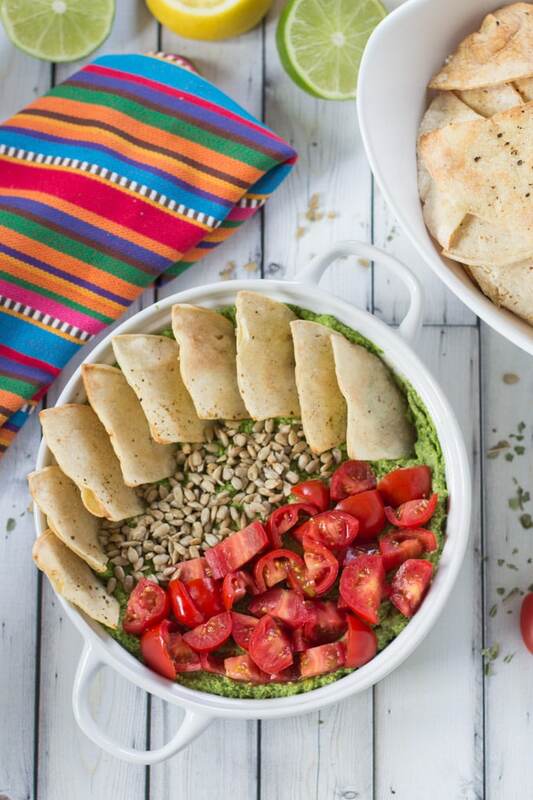 Scoop the pesto into a medium-sized dish or bowl and serve with the tortilla chips. You can also add other toppings such as chopped tomatoes and additional sunflower seeds. Keep the pesto refrigerated until ready to use. Leftovers will keep in the fridge for 2-3 days. (Do not refrigerate with the tortilla chips as they will get soggy). I used freeze dried basil in this recipe but fresh basil also works. I also used basil infused extra virgin olive oil to enhance the basil flavour, but it is not necessary. For the tortilla chips, you can adjust the amount of salt to suit your tastes, or you can substitute other seasonings such as cajun or chili powder, if you prefer your chips spicy. The tortilla chips will serve 2 people, but you will likely have pesto left over. You could either double the recipe for the Sea Salt Lime Tortilla Chips or serve some carrot sticks and pretzels with the pesto. Then it could easily serve 4 people as a light appetizer.